After a bit of planning and thinking, I set out to Gokarna – A small town in Karnataka along the coastal line. Pausing for a brief time in Sirsi – one of the other cities close to my heart, I started off with a local bus to Gokarna. The journey had been overwhelming, and I felt lots of things within me. I felt peaceful and happy when I looked out the window and saw the lush green fields. With no scorching sun over my head, the weather seemed to be perfect. I saw a school girl who was with her friends. They all seemed absorbed in their little chit-chat. It made me think about my school days and my friends. Sudden outbursts of rain and the dripping water next to my seat brought me back to present – I love showers and to me, every rainfall is unique. The smell of the mud of the earth drenched with rain is my favorite smell! So, here it was – once again pouring down heavily. The rains changed the landscape completely. A moment ago, there were perfectly cultivated lands, and now they were filled with water! The horizon looked stunningly beautiful as it was partly covered by mist and the cloudy sky reflected over the fields. I reached Gokarna in the afternoon. It was still raining heavily, and I took a walk to the temple road. For the unknown, Gokarna is an idyllic town tucked away along the beautiful coastal line in Karnataka. To the world in general, it is popular for the beaches, the temple, and Yoga. But, if you look deep inside, you will see a hidden gem of a place which is so picturesque and appealing. It sounds like a pretty picture, with tall coconut trees lurking in between the canopy which makes a brilliant backdrop against the sky. 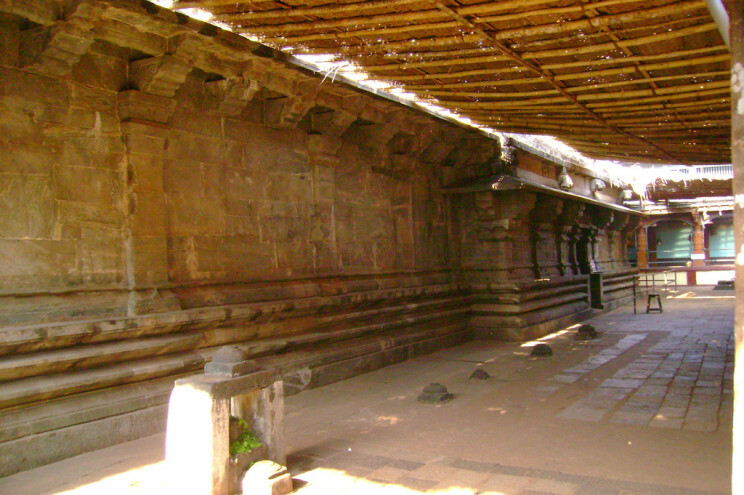 The famous temples of Gokarna are the Mahabaleshwar temple and the Maha Ganapati Temple. 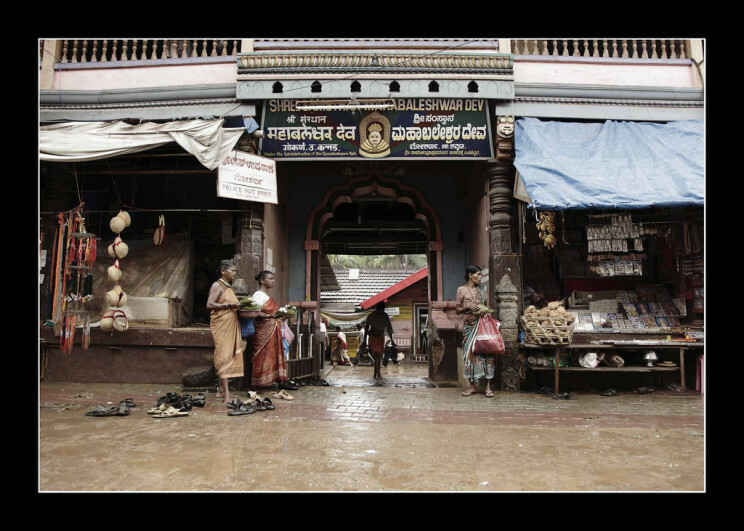 A small road in front of the temple entrance leads to the gusty and the rough Gokarna beach. Enjoying the heavy rain, although it was turning bad by now, I decided to stroll till the end of the road to catch a glimpse of the beach. But the mist made it look as if there was no beach at all! Any little play in the beach was obviously out of the question and practically one could not get much. But, I could not resist the temptation of going to see the beach during rains. I’d never been on one during normal rains, leave alone a heavy downpour. Dance of the waves in the rain! So, here I was gazing at the enormous waves which were anything but far from what I’d anticipated. From the sea-shore, the waves looked terrifying and ferocious. A slight shudder went through my spine looking at the gushing waves. It seemed like the waves had a thing to overpower the nasty winds and the rain. It looked like each one of them were engaged in a rather violent fight to establish dominance! Above this, the mist stood tall and wide across the sky.It was both a spectacular and an interesting sight. Lost in this wonder, I stood there for a long time still clutching my umbrella very tightly. 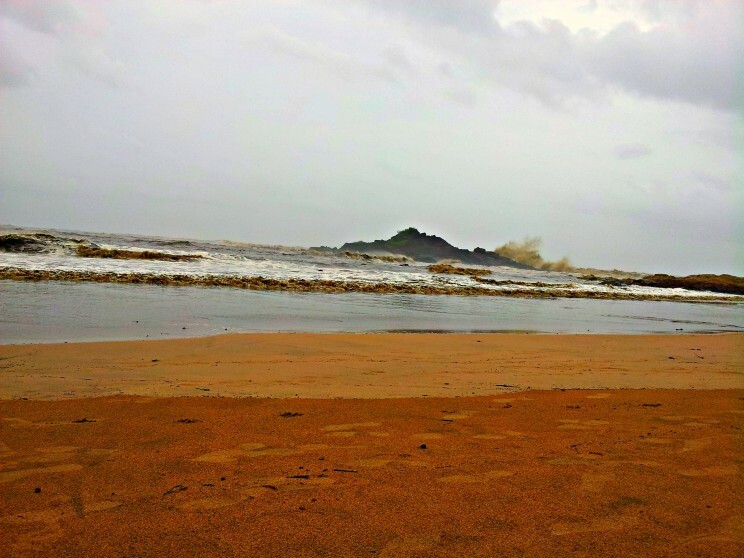 From there, I took a tuk-tuk to Om beach – a beach synonymous with nightlife and fun in Gokarna. It is at about 8 km from the temple. It is comparatively small and secluded.If you are not someone who enjoys the crowd, then this beach is for you. But, it is the opposite during the peak season here. 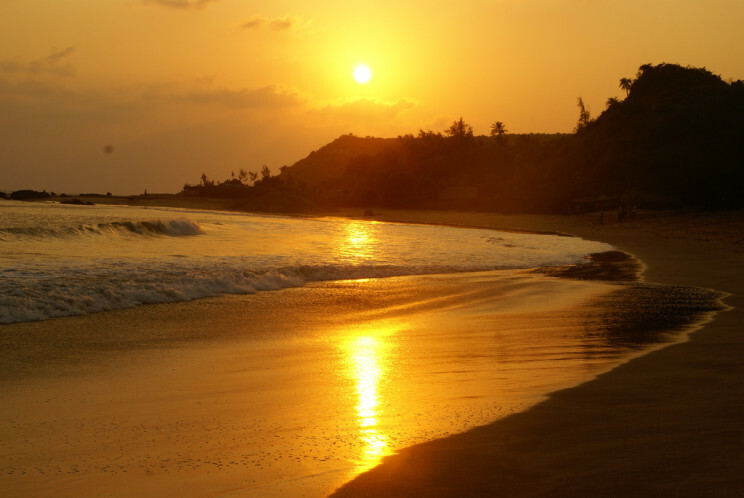 The same is the case with the other three beaches in Gokarna – Half Moon Beach, Paradise Beach and the Kudle beach. All of them are not very distant from each other and can be easily reached. If you are looking for a happening nightlife akin to Goa with late night eateries and drinking, then travel to Gokarna during the peak season between October to January. Of course, stay is slightly overpriced and the place would be crowded. Many shacks and temporary resorts come up during this time. But as for the accommodation, you can still look out for some decent B&B’s or home stays. If you are looking for some place which is quiet or where you can lay back and relax, then head to these beaches of Gokarna during the off season. The best part would be cheap accommodation. There wouldn’t be those temporary resorts by the beach side, though. Plus, you get most of the beach for yourself to have fun! The downside is the weather – the summers are hot here, and the rains are intermittent and inconsistent. But, if you love storms like me or do not mind the sun, then you could experience an entirely different version of this place! So, what do you think? What are your thoughts on this tiny town? Follow my stories on Facebook, Twitter, and Instagram.